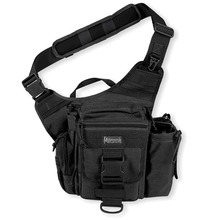 Maxpedition Jumbo S Pack Black 0413B The S-Type JUMBO's main compartment is over 38% larger than the Fatboy S-Type. In addition, it has three zippered accessory pockets, two sleeve pockets, and one drawstring pocket fitted for a 32oz/1L Nalgene water bottle or a radio. The Jumbo S-Type has three places for modular expansion with other Maxpedition accessories using Malice clips. External keyper on shoulder strap for gloves and internal silent keeper for keys. Top of lid pocket: 6.5" x 3" x 1"